The ATSF Motive Power Building was constructed in 1910 and expanded in 1930 to serve as offices to the adjacent Santa Fe Railroad shops. 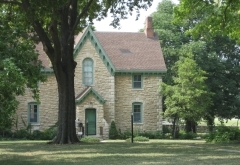 The turn of the century represented a new era for Santa Fe when Topeka citizens supported the relocation of the shops to the Oakland neighborhood in 1902. When completed, the investment was nearly $400,000 and employed 3,000 men and the shops covered nearly 120 acres. Many workers lived in the surrounding area and the availability of railroad jobs is partially attributed to the influx of Mexican immigrants to Oakland. In addition to housing offices, the Motive Power Building functioned as a sort of community center for shop employees and their families. An auditorium on the top floor was used for social activities and even included performances by the Santa Fe employees' band. The shops evolved to meet the railroad's changing needs as it transitioned from steam to diesel power and terminated passenger service. The Motive Power Building closed its doors in 2002. The four-story building features an exposed concrete structure and a simplified, symmetrical facade reflective of the Commercial style with applied Classical Revival ornament. It is nominated in the area of commerce. 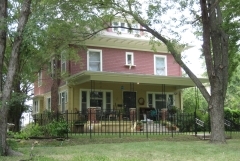 This house listed for its local significance in the area of architecture and its association with Morton Albaugh. 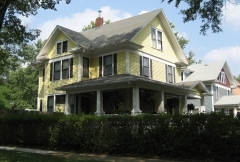 This is a two-story American Foursquare with hipped, asphalt-shingled roof and hipped dormers. The house is clapboard clad on the first floor; the second floor exterior is shingled, and example of a Shirtwaist house. Brackets accent the cornice line under the wide eaves of the main roof and dormers. The window and door surrounds exhibit the simple style that is a hallmark of the foursquare. 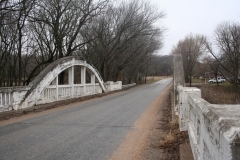 Morton Albaugh rose to statewide prominence in the 1880s as an astute political organizer for the Kansas Republican party, and remained an important figure in Kansas politics until his death in 1918. In the course of his career, he managed three gubernatorial campaigns and was the chairman of the Kansas Republican state central committee for six years. 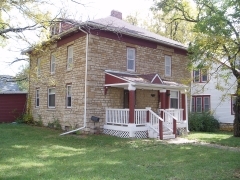 He also served as state bank commissioner and was appointed to the post of clerk of the US district court in Topeka. 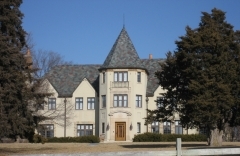 Frederick A. Anton (1866-1944) established the Topeka Tent and Awning Company in 1901. Topeka Tent and Awning was headquartered in Topeka, KS at 130-134 Kansas Avenue from 1917-1987 when the family sold the business. The company’s success and expansion was directly related to the numerous patents that Anton received for various improvements to awnings and awning arms. Anton received his first patent in 1911 (Anton Lateral Awning Arm), the year that he became an American citizen. During WWII, the Topeka Tent and Awning Company secured a contract totaling over $500,000 to make tents, flies and cot covers for the United States military. 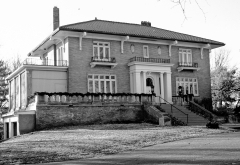 The c1927 Anton-Woodring House was listed for its local significance for its architecture and its association with Frederick Anton. 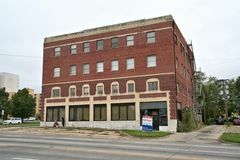 Topeka’s Casson Building is an excellent example of the Corner Neighborhood Store property type that evolved into a speculative office building. Constructed initially with two floors in 1927, the Casson Building was designed to provide residential apartments and commercial services for residents in the surrounding neighborhood. The building was expanded and modified in 1947 to provide office space to multiple tenants while still providing retail space on the first floor. The brick colors, ornament, and fenestration differentiate the 1947 addition from the 1927 portion. 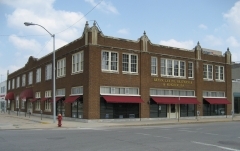 The Casson Building is located approximately four blocks from Topeka’s downtown commercial core along South Kansas Avenue; it dominates the small commercial center at the intersection of Topeka Boulevard and Sixth Avenue. 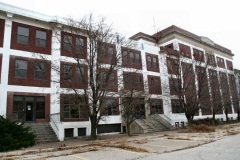 The period of significance begins in 1927 with construction of the first two floors of the building ends with the addition of the penthouse in 1956.